Proposal for new timeline design. Here is the initial proposal. The idea is that every clip type should have a defined color. Added a proxy and effect togge to the clips. Added effect toggle to the track headers as well. Will post more as I develop the idea. I think the locked track stuff should be orange. Red should generally be reserved for things that can be destructive, errors or things meaning off/disabled. I don't think the entire background of a locked track should have its color changed. Instead, there should be a vertical highlight bar with the lock color at the right edge of the track header. Is there going to be enough space for the track labels on each header? What if I want to name a track something longer than 2 characters? I noticed you used green as the color for "Target". What is a "Target"? Is that the current selection? If so, the color should be Plasma Blue (#3daee9). Green should generally be used for positive things or successful operations while Plasma Blue is used for selections. When you lock it it will disable that track, you wont be able to move clips in the track anymore. I think the red overlay is a good visual support in a big project with many tracks. I was thinking of the "led" light to activate the track to turn red as well. those two characters "v1" or "a1" are more of the track id, used to help you target a track. there is a place for naming a track which i will make a proposal soon. The target track is the chosen track to move the clips from the project bin to the timeline. Video-track=blue (clip=blue) and the 4 other types different but on the same color-type (color clip/ slideshow clip 25% darker/ title clip 25% brighter/ library clip 50% darker). Audio-track=green (audio associated with video), ungrouped audio (25% darker), audio only (25% brighter), effect audio (50% darker). Individual colors for each clip should be possible (for a 2nd timeline with "pre-selected" clips). Other basis color for video and audio should possible as well (for a 2nd or 3th timeline). But we can switch off colors as well. By disable, do you mean actually make it so that video/audio on that track won't be visible/audible? It's not really off/disabled if it still plays video or audio. My concern with changing the entire background color is that it will limit the number of colors that look good on locked tracks. If any transparency is used on colored clips, then those colors can look especially bad against a red background. Don't the track headers stay visible no matter where you scroll to in the project? What if instead of doing the whole background, you just changed the color of the border around the track? You wont be able to add clips to that track nor move any item in it. But you can see and hear the content already there though. Hmmm, I had done a proposal where I changed the background of the track header only but it didn't look good. Will think more about it. More ideas for locked tracks. I cannot see orange working though in this case. What do you think @ndavis? Proposal for track names. Should we have a max character limit? Would you mind sending me the mockup so I could play with it? Writing text isn't the most efficient way to make visual suggestions. I think it would be a good idea to shorten long names with an ellipsis and use a tooltip to show the full name when the track is rolled up (like track A2 in the original mockup). When the track is not rolled up (like track A3), wrap the name to fit the rest of it onto new lines until it runs out of space and needs an elipsis w/ tooltip again. Are there only 2 types of tracks (Audio, Video)? Can each track only hold one type of content? Can a track only hold one clip at a time? For example, a video track with 2 different imported files on it. The video track can contain videos, title clips and images (bitmap or vector). That is why in the general proposal each clip has a different color to differentiate. A track can handle a sequence of clips. Didn't understand the example though. Here's what I've got right now. I thought the A# and V# labels were redundant, so I removed them. I decided to keep the lock white since I thought it looked better for a monochrome style icon. I also added an orange outline to the locked track area. I like the orange outline, elegant. Will think of some suggestions as well. One thing now we have to think are the icons. Should they be monochromatic or colored? Should there be two icons, one for each state? Or should they be highlighted if active? I see. This must be a fairly common thing in video editors. If this is what people are used to, then it should stay. I have experience with DAWs, but not much with video editors. In general, monochrome style icons should not be colored (compare action icons to emblem icons). What do you mean by 2 icons for each state and highlighted if active? With the recent mute icons changes how can we proceed? Maintain as the proposal above or we should add color? I see a problem reappearing with the unlock/lock icons which I fought I had squashed before. The open lock is barely distinguishable on higher resolution screens from the locked one, as there's not enough visual difference. On purpose back then I reworked Kdenlive icons to use the slash when unlocked, as this gives much more visual difference than just a small break in the lock's shackle. So, please keep in mind higher res displays, and make things clearly visually different! The track locking frame indication gives both clear visual guidance but can also distract enormously, more so when multiple tracks are locked, which I sometimes need to do. Any of my projects has at least a topmost locked company logo track ... which currently won't distract, but with the new suggestion it would stick out prominently. Of course, people are different, so some prefer prominent indications depending on their workflow, while others might get diatracted by too much bling. Which resolutions are the lock/unlock icons too small for? Is this also with scaling enabled? 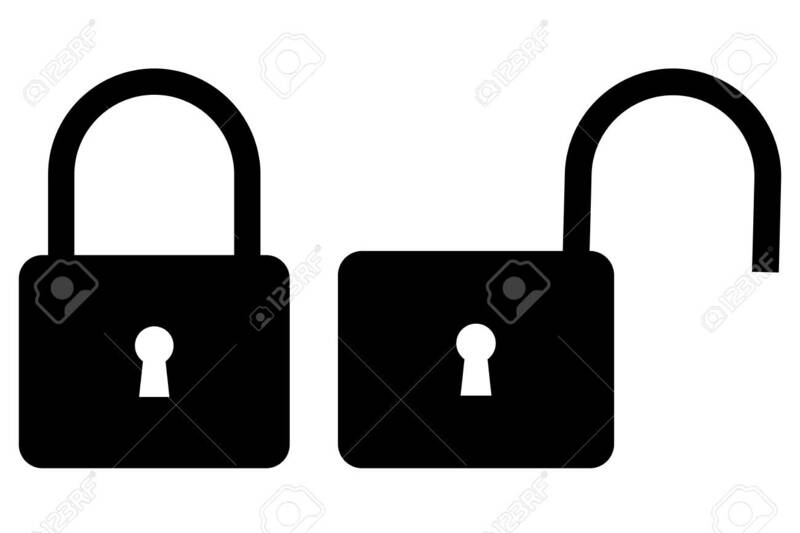 Can you send a full screen screenshot of an instance where it isn't easy to tell the difference between lock/unlock icons? Maybe some kind of greying out or adding transparency would be an idea for locked tracks, might as well work for muting audio or hiding video. Greyed out elements are common in GUIs to indicate something is disabled or can not be changed. 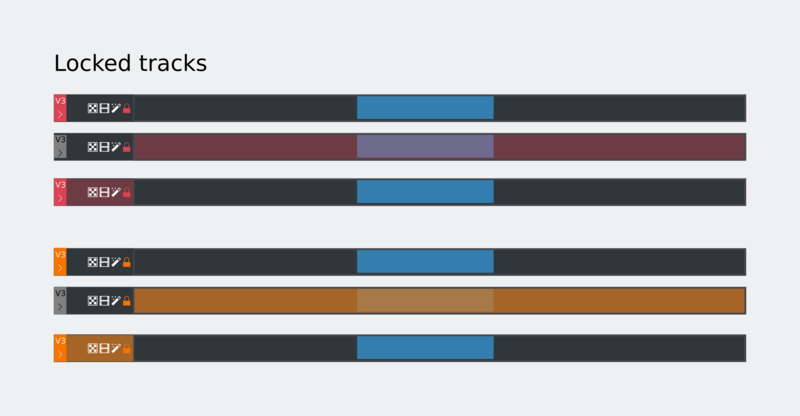 Regarding using outlines for locking: imagine having three tracks below each other, where the top and bottom ones are locked. It should be clearly visible that the track in the middle is not locked, without having to look closely at the left and right edges. When thinking about colors in general it might be worth to keep in mind color schemes with highlight colors different from blue, as well as specific negative neutral and positive colors. Using the theme colors can result in better visual coherence with the rest of the UI, on the other hand there may be color schemes which make some things hard to distinguish. What's the most important element in our UI? Just something to keep in mind when thinking about colors and transparencies... It's a UX classic mistake to make, to only look at images of the one part of the interface being discussed, separate from the rest of the UI and so lean towards whatever design is most striking. This leads to every UI element being designed to stand out the most, which makes for a jumbled, distraction filled UI where every element is vying for the users attention and distracting their attention away from the most important information. I would argue that the most important pieces of the UI are actually the preview window - how your project looks, and the contents of the clips, or what you're going to add /move in the project. These deserve maximum emphasis, and everything else should be the minimum that can still be quickly recognized by the user. Now, I *do* think that different colors for different track types is a good idea, however, tracks take up a large part of the visual space of the UI, and what sort of track it is, is not the most important piece of information in the entire Kdenlive window UI. Accordingly, I would keep the colors chosen, fairly muted, so they're not distracting from more important information, such as the preview window and what the actual contents of each track are. For example, it's more important that the user sees quickly that it's the clip of their two year old blowing out birthday candles, and how that looks in the playback, rather than that track V3 happens to be a video track. Also for that reason, I'm really hoping that thumbnails are just missing from the mockups above and not as a design choice for the future UI. I'd drop the keyhole as unnecessary detail, and make the width of the curved bar thicker in smaller sizes for emphasis, but you get the idea. IMHO, sending a screenshot doesn't make sense: because it won't ever reflect my screens resolution, as well as my workplace and eyesight correctly. scaling isn't the issue, it is the icon design in itself, when e.g. icon size of 24 is used. Are you aware that icons need to be in a square design? So your suggestion needs to be scaled down in order to cope with its almost 1.5x width for the open state. In turn, it won't fit into the overall UI breeze icon design anymore. There's a good deal of work and thought for why I originally designed the track icons as they were, it was not a flash of the second. 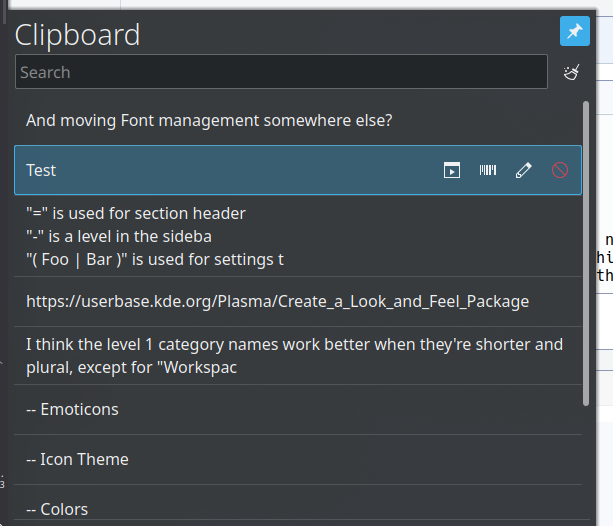 As for the red cross-out, I'm sharing your sentinent, albeit you should check with the KDE icon and breeze icon design guidelines. At least that gives the reference, and we should be very clear about why and when we deviate from them. Yes, after the refactoring we'll add inline transitions for audio and video. Another quick proposal about colors. Locked tracks get greyed out and track header changes color to red. Changed color of selected track. 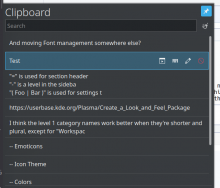 It would be nice if this kind of stuff could be shared with other KDE applications as a library in case anyone ever wanted to start developing a DAW or audio editor for KDE. Would those look just as good with a light theme? If not, consider partly transparent clip background colors. The clip background colors will naturally be less saturated when combined with the white or dark grey of the application background. This way you can also use black for waveforms with light themes and white for waveforms with dark themes. The colors I used for the background in my mockup are the same colors already used by Plasma and KDE applications in various places. I don't know exactly what transparency values they use though. I am not sure we want a different color for each clip type. This would make the timeline quite messy in my opinion and distract the user. But I am open if you think it's better. Anyways, we must decide track colors. I am using this palette but with desaturated colors. I guess we can do some tests to see and brainstorm some more. Will compile and test as soon as it is applied. Here is the current state after the first changes to the code. Wouldn't it be a good idea, to let the users decide, which color a specific clip should have? This would be a great way to organize the timeline for individuals. At the beginning of https://helpx.adobe.com/premiere-pro/atv/cs6-tutorials/customizing-the-timeline.html you can see the different colors and change possibilities. Yes, I like the idea to have a default scheme and the ability to customize the colors as well. Could be a junior job. First attempt looks good. Title clip is selected. 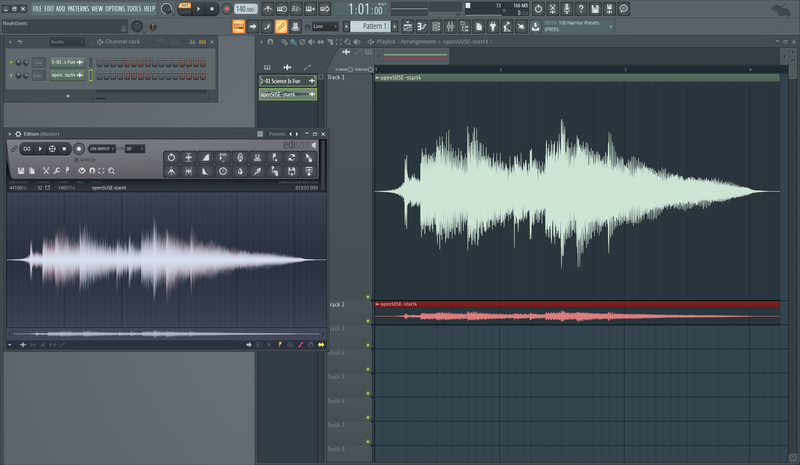 Do audio clips normally only show one side of the waveform? If so, that might make it more difficult to spot phase related issues. No. There is a configuration option in Kdenlive's settings dialog to show separated channels or not, and it directly changes the display. The waveform visibility is in Adobe Premiere mutch more better. Yes, the waveform should probably match the color of icons and text (Breeze Dark: #eff0f1). The Adobe Premiere waveform also has a line at the middle to help show where the wave form starts and ends. With build #60 the center line is a bit thick. Can we make it half that thick? Build #61 looks good. Even with "zebra" for the channels and good contrast. Top would be if we have the channel names "L,R,Ls,Rs,C,LFE". Changing the color theme changes the color of the audio and video clip as well.